It is for all those medical professionals who are involved in the process of teaching. Although the general principles of teaching remain the same worldwide, this book is tailored to meet the demands of ‘Faculty Development’ in a Medical Institution. This is a text in demand from not only medical teachers, but also from all the faculty of paramedical and allied health courses. • Covers three broad aspects of teaching and learning, viz., (i) Technology in and of education, (ii) Management of education and (iii) Educational research. 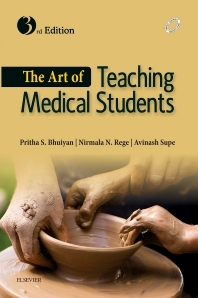 • Beautifully illustrated educational science applies to medical teachers as well as members of heathcare team and also all those who are involved in the art of teaching. • Authored by experts who have vast experience in medical education at both national and international levels. Their vision, thought process and knowledge get reflected in their writings. • A ‘must read’ book for every young faculty making his/her entry in the educational field as a medical teacher before embarking on educational activities.